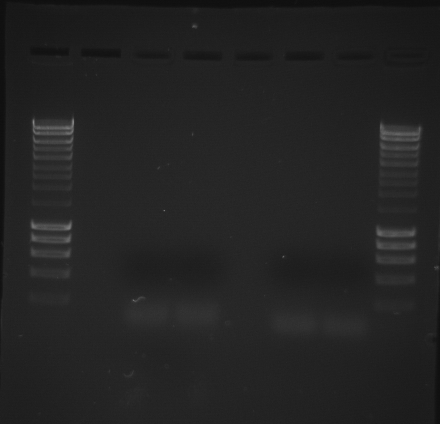 Used Cg_COX2_3’RACE_short (SR ID: 1197) & Cg_COX2_3’RACE_long (SR ID: 1196) and the Clonetech SMART RACE cDNA Amplification Kit (unknown acquisition date) to attempt to acquire more 3′ sequence of the C.gigas COX2 isoform. Used Gigas 3’RACE cDNA (from 20080610). No products produced. This could be due to a large number of factors. The age of the cDNA (from 20080610) is well beyond what the Clontech manual says for storage term (6 months). Additionally, the Clontech polymerase used was nearly 6 years old. The kit (and its components) are of an unknown age and could factor in to the failure of this procedure. Also, the primers that were designed had less than ideal Tm, per the kit’s recommendations. May need to sequence some previously purified potential COX2 fragments in order to obtain a more useable region of the gene for RACE.